Throughout the golden age of the Angkor period, the kings built huge cities and temple complexes symbolic of their power and divinity. One of these capitals was created in 921 by King Jayavarman IV at Koh Ker, about 65km from Angkor. This standing guardian lion has come from there. Such lions were placed on terraces and stairways to guard the central pyramidal structure that represented Mount Meru, the residence of the gods at the centre of the Hindu world. 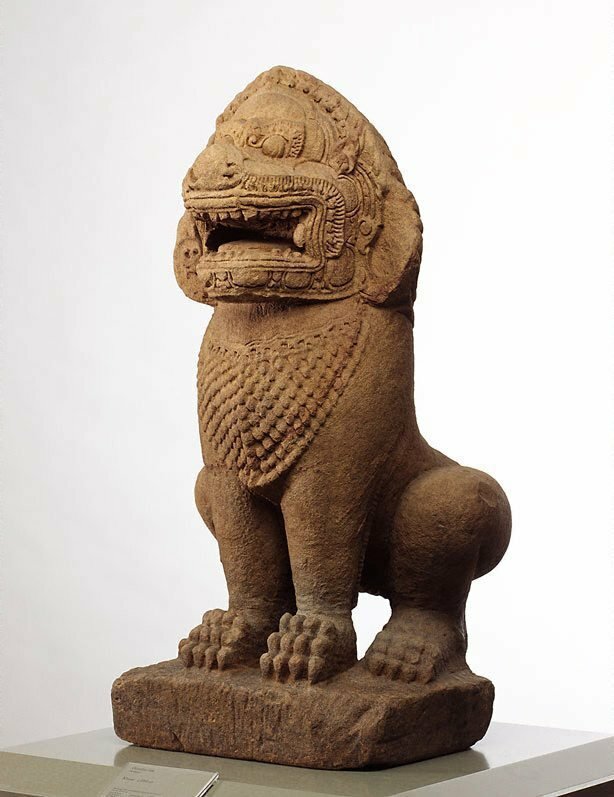 Lions were not native to Cambodia and the Khmer sculptors devised their own fanciful interpretations. The characteristic full-frontal pose and upright stance lend the figure a composed regal air, while the elaborately carved demonic head and patterned chest show the Javanese influence so important in Khmer culture. The Asian Collections, AGNSW, 2003, pg.314.